A special report from the U.S. Department of Justice estimated that 3.7 million household burglaries occurred each year between 2003 and 2007. But even more troubling was the finding that a household member was present during approximately one million burglaries, with an average of 266,650 becoming victims of violent burglaries in their homes. With violent intrusions accounting for more than seven percent of all home burglaries, it’s a legitimate fear for homeowners. To help homeowners stay safe during a burglary, Alarm.org offers these tips. Should you suspect someone has entered your home, it’s important to act quickly. First and foremost, do not attempt to apprehend the burglar yourself. If you’re near your home security system, press the emergency alarm to notify your alarm monitoring company that you require immediate assistance. If you are not close to the alarm panel or your home isn’t equipped with a monitored system, everyone in the home should immediately, and quietly, move to a prearranged safe place. A neighbor’s home is an ideal safe place – but only if you are able to exit inconspicuously. If you’re on an upper level or cannot leave without encountering the burglar, grab your cell phone and quietly get your family into a hiding spot such as a closet or crawl space. Once your family is in place, call 911 and keep the operator on the line. Stay quiet in the safe space until police arrive or until you are certain the assailant has left your home. Should you be discovered by the burglar before getting to a safe place, don’t panic or make any sudden movements. Avoid looking the intruder in the eyes as he or she may interpret it as an act of aggression. Keep your hands at shoulder-level and visible to the criminal. Comply with demands and allow the burglar to leave with your possessions – nothing is worth losing your life. In a life-threatening situation, try to escape before resorting to violence because the burglar usually has the upper hand in these situations. Additionally, attract attention by screaming or making loud noises but no matter what, never agree to go to another location with the burglar. It is likely the assailant will take you to an isolated location where you will be unable to escape or call for help. If you’re face-to-face with the burglar, take mental notes of his or her physical appearance (height, build, hair, eye color, ethnicity, distinct markings) and mannerisms (accent, walking style) so that you can give a description to police. An alarm system is your first line of defense against burglary at your home and can summon help in times of distress. Something like a multifamily security system would help prevent your property and its assests from being a target of a burglary. No one wants to come home and find their home in a state. Your home should be a place where everyone should feel safe. In a recent study conducted by the University of North Carolina at Charlotte, researchers interviewed more than 400 convicted burglars and found that almost 60 percent of the incarcerated burglars indicated a home with an alarm system would cause them to seek an alternative target. In fact, an alarm system can have a blanket effect for your neighborhood. A 2009 study conducted by Rutgers University School of Criminal Justice found that neighborhoods in which security systems were densely installed have fewer incidents of burglary than neighborhoods with fewer systems. To ensure you can rely on your security system, it’s important to select a trustworthy home security provider. Companies that are members of the Electronic Security Association (ESA) are among the most credible installers in the country and must adhere to a strict Code of Ethics and Standards of Conduct. You can find a local home security company that is a member of ESA by clicking the “get quote” button on the right side of your screen. Simply enter your zip code, answer a few questions about your home security needs and a security company nearby will contact you. 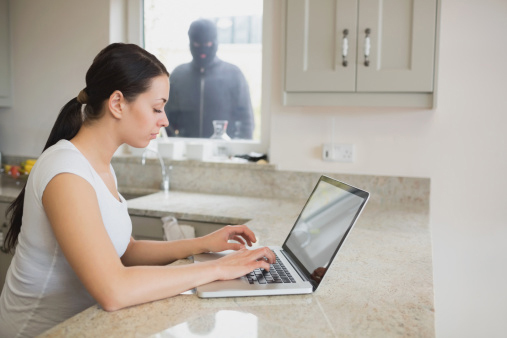 Knowing what to do during a home intrusion is vital to the safety of your family. By installing a home security system, you could avoid a frightening and potentially life-threatening home burglary.